“Now I rejoice in my sufferings for your sake, and in my flesh I am filling up what is lacking in Christ’s afflictions for the sake of his body, that is, the church” (Col. 1:24). 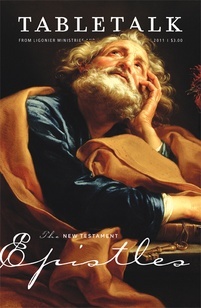 Questions about the sufficiency of Christ due to false teaching that emphasized asceticism and angel worship prompted Paul to write to the Colossians (Col. 2:16–23). Additionally, there were doubts about the ministry of the apostle himself, as his defense of Epaphras implies that aspersions were cast on the gospel delivered in Colossae via his faithful co-worker (1:3–8). As in Corinth (2 Cor. 10:1–12:10), it seems the teachers of error put forward Paul’s sufferings as proof that his preaching was useless in advancing God’s kingdom, thereby attacking his ministry. We conclude as much from today’s passage, wherein Paul refers to his suffering as Jesus’ emissary. The apostle interprets his sufferings far differently. His pain does not invalidate his ministry but proves the legitimacy of his call, for his suffering fills up “what is lacking in Christ’s afflictions” (Col. 1:24). At first glance, this difficult passage seems to imply that Jesus’ atonement is somehow deficient, and believers make up for what is missing through their own suffering. But Paul is not teaching what would be contradictory to his teachings elsewhere. He has just emphasized the sufficiency of Jesus as the God-man who makes peace between the Father and His people through the “blood of his cross” (vv. 15–23). Paul will go on in Colossians 2 to describe the victory over sin, Satan, and death Jesus won at Calvary, refuting any suggestion that the cross is lacking. Moreover, the Greek term thlipsis, translated sufferings in 1:23, is never used for the redemptive sufferings of Jesus in the New Testament. What then does verse 24 mean? Since the verse is perhaps better translated as “filling up what is lacking with regard to the Messiah’s woes,” Paul is possibly referring to the messianic woes — a time of trouble for God’s people that precedes the consummation of the kingdom and the resurrection of the dead (Ezek. 38; Dan. 12:1–3; Matt. 24:4–14). These woes, seen clearly in the AD 70 destruction of Jerusalem, will characterize the entire period between the first advent of Jesus and His return (Rev. 6:9–11). Until the woes are completed, the suffering of the church fills up what is missing, advancing history toward the kingdom’s consummation. Far from invalidating the gospel of Christ Jesus, suffering evidences that the sufferers really are God’s people and brings the kingdom ever nearer. We may not always think of it in this way, but our suffering for the cause of Christ actually brings us closer to the day of His return, for God has ordained that the day of Jesus’ victorious coming would be hastened through the work of His people (2 Peter 3:11–13). It is therefore possible to find comfort and joy as we endure pain and tragedy for the gospel’s sake, for our trouble is filling up what is lacking in the messianic woes allotted to this age.